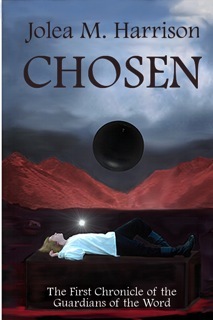 In Chosen, Jolea M. Harrison transports us to a world on the cusp of destruction, caught in a thousand year cycle of ever repeating time, trapped between the warring Gods and the demon, Belial, with one young hero chosen to save not just the world, but the Gods themselves. Dynan finds himself on a corpse-strewn hillside, uncertain if he's dead or alive, charged with saving the soul of his ancestor, the most powerful telepath to ever exist. Dynan has telepathic powers of his own, only he doesn’t know how to use them. With monsters and minions trying to eat his soul, the demon’s lair isn’t a place conducive to learning anything except how to run and how to hide. Jolea was born in Washington DC and has lived outside the Nation's Capitol most of her life. She spent many a summer roaming around the museums on the Mall, watching fireworks and concerts. Her older sister started a children's theater and they put on plays, ala Rooney and Garland, for a number of summers. They even took their shows on the road, locally, and made something of a name for the little troupe, Ateow Children's Theatre or ACT! People came out of their way to see their shows, which they put on in the side yard of the family farm, running extension cords out for the sound equipment. When the Concord jet went over, the actors had to 'freeze' in place until it was gone. Ateow’s crowning achievement was producing The Hobbit at the Dogwood Dell in Richmond, Virginia. The production drew HUGE crowds and according to the author, was a huge amount of fun to be involved with. It so happens that J. R. R. Tolkien is Jolea’s favorite author. After a little bit of moving around, Jolea landed back in Virginia and has been there ever since, residing in her childhood home, a 200-year-old Civil War era farmhouse. A doctor lived there during that terrible conflict and treated troops at a number of field hospitals in the area, as well as right there at the house. The bug to move around is no longer present for Jolea, so she doesn’t believe she’ll be moving again. Jolea began writing when she was in middle school and hasn’t stopped since. She is now working on the second book in the GOtW series, Myth. She loves writing, is passionate about it and would love write above all other things. It would be a dream come true to be able to make a living making stuff up!